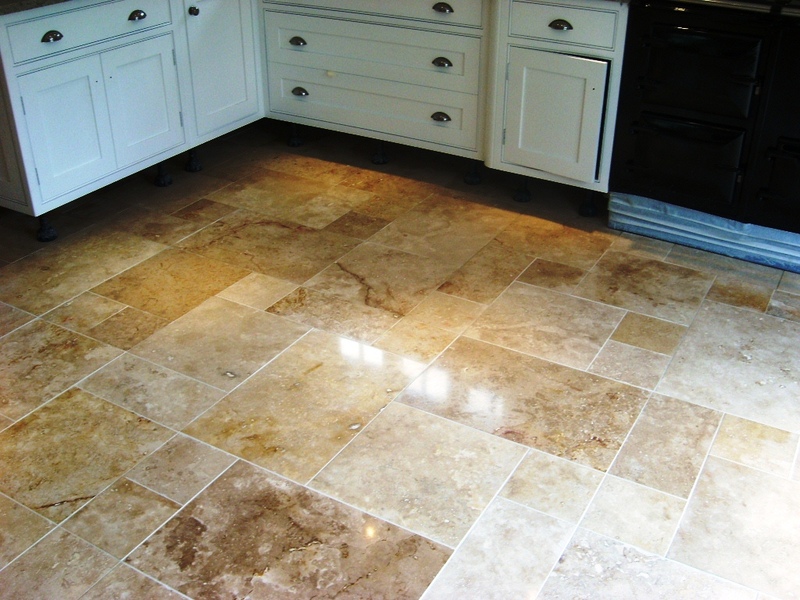 Travertine floor tiles look amazing when they have just been installed but after a few years the polish wears down, dirt starts to become ingrained in the stone and they start to lose their appearance. They do need regular maintenance and potentially re-polishing and these tiles installed in kitchen in Havant were no different. First job was to remove the kickboards under the kitchen units and cover the free standing fridge with a wrap of plastic, this is a necessary precaution to stop fluids soaking into the wooden kicker boards and splashing the fridge. 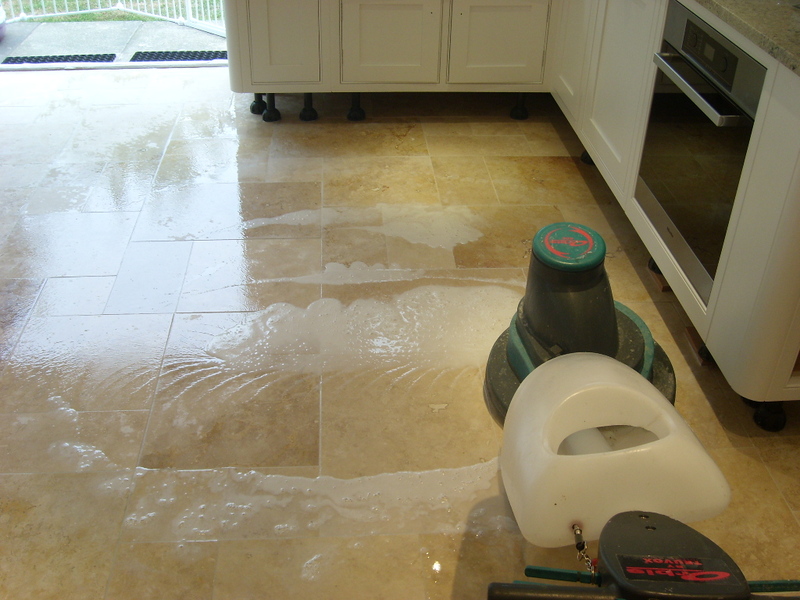 A dilution of Tile Doctor Pro-Clean was applied to the floor with a mop and left to soak in for around fifteen minutes. The grout lines were then given a good scrub and we ran a scrubbing pad fitted to a rotary machine over the tiled floor to give it a good clean and remove any lose debris. 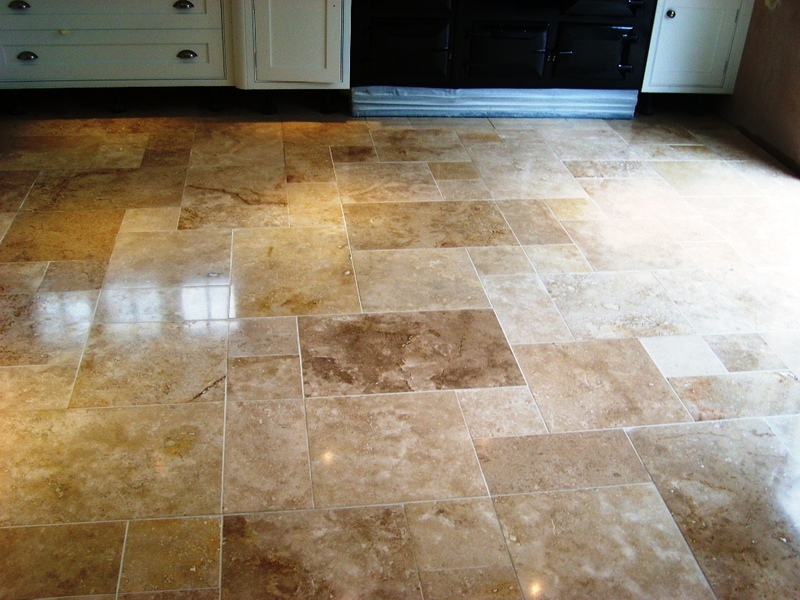 To restore the polished appearance of the Travertine it was burnished using a set of diamond encrusted pads which come in four grades and are applied to the stone floor with a little water in sequence from Coarse through to finally Super Fine which provides the final polish leaving a high shine finish. The floor was given another wash and left to dry off overnight and we came back the next day to seal it. 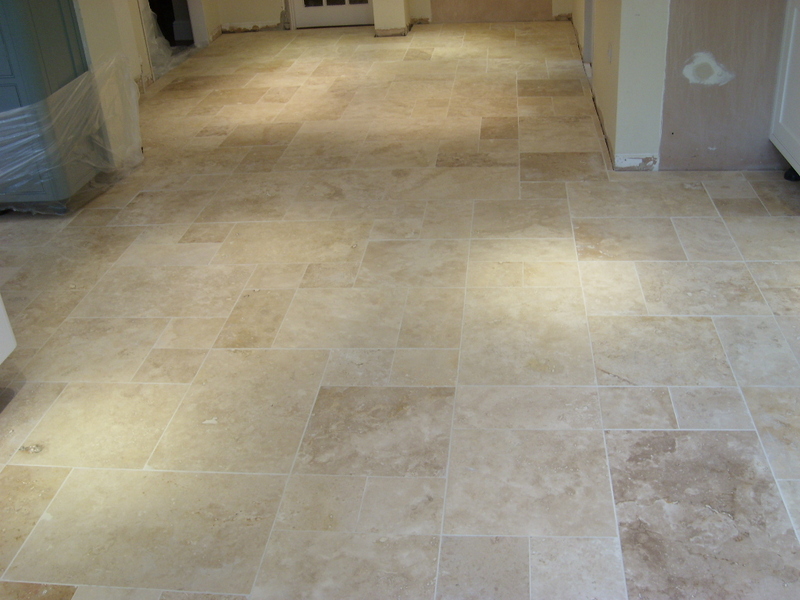 We check the floor was dry first and then proceeded to seal the Travertine tiles using two coats of Tile Doctor Colour Grow which really enhances the colours in natural stone as well providing excellent stain protection. I think you will agree from the photographs above that the Travertine tiles looks so much better and the natural brown and gold colours in the stone have really come through.